I have a hunting camp where there is a power meter set with a hook up for a camper. It appears that there is no ground wire coming out of the box to earth ground. This was installed way before I owned it so I'm just thinking I'd like to fix this if it needs fixing. would the right thing to do be to drive a copper rod deep into the earth with a bare wire going to the ground bus in the box? This box is mounted to a light pole and it all sets outdoors. There is a buried 30 am circuit going over to where the camper is parked and a single outdoor sytle outlet box and thats about it. 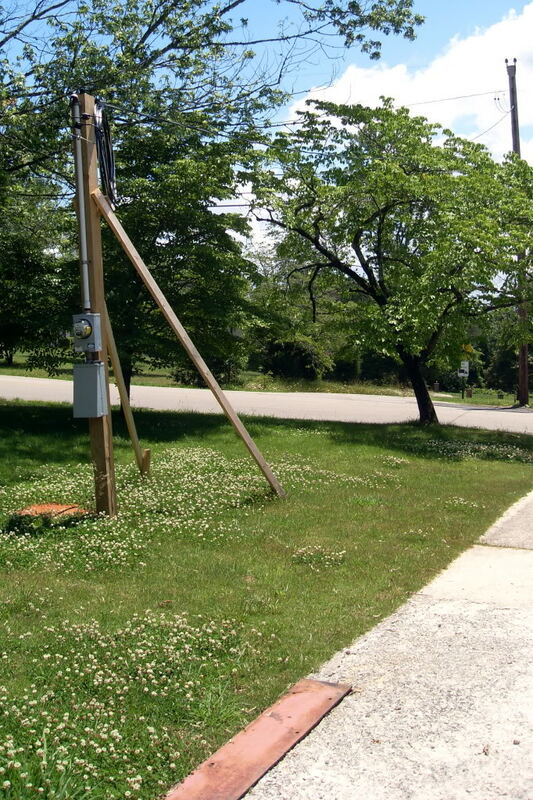 There SHOULD be a ground at the meter pole. You have an under ground service, if there are 4 wires in this bundle, you should have a ground. Two lines, a neutral and ground. Water vapor IS a gas. Yes you should have a ground wire at the pole. Go to a hardware or electrical supply and buy a ground rod, a clamp and enough copperweld to reach from the box to the stake. Pound the stake into the ground until about 2 inches are left. Attach your clamp to the rod. Run the copperweld from the box to the stake. You better put that clamp on the rod before you start pounding that thing into the ground or else you'll be trying to figure how to pull it back out. And make sure you're in solid ground, not fill. I see what you mean. I'm going to pick up an 8 ft rod and some copper weld wire and take care of this. The last clamp I put on was a 2 piece job. And make sure the rod is outside the drip line where it can get some water. Besides soil composition, moisture has the greatest effect on grounding resistance, moisture makes it lower and you want it as low as possible.